Transparency happens one incident at a time, one process at a time. True transparency, the kind that benefits both the customer and the company, doesn't come easy. It requires pre-incident planning, intra-incident collaboration, and post-incident communication. 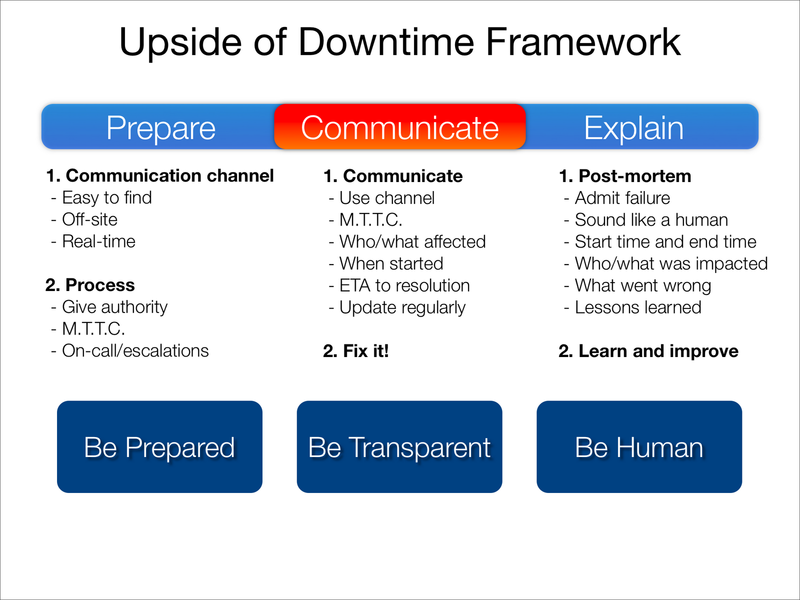 I plan to blog about this holistic framework in the near future, but today I'd like to use the downtime postmortem posted by Mike Champion, describing the recent downtime of oneforty.com, to build a basic template for how to handle post-incident communication. Admit failure: Yes, using their Twitter account. Sound like a human: Yes. Very non-generic and highly detailed post. Have a communication channel: Partial. The Twitter account exists, and the blog by Mike Champion exists, but it would be hard pressed as a user to find these two venues when the service is down and I need to know what's going on. Start/end time: No. Can't find that anywhere, and have to extrapolate it from the first tweet to the last. Who/what was impacted: No. I have to assume the entire site and all visitors were impacted, but there was no mention of this. What went wrong: Yes. A lot of detail, takes us through the entire experience of root cause analysis. Lessons learned: Yes. Extremely solid. Human elements: Yes. An engaging story. What others can learn from this experience: Yes, a lot to take away if you are an Engine Yard customer. The basic aim of a post-mortem is to reassure your customers that you recognize there was a problem, that you have resolved it, and that you are going to learn from the experience. Holistically, oneforty.com accomplished this. When thinking about your own post-mortems postings, just imagine an angry customers that has lost faith in your service, and needs to be reassured that you know what you are doing. If you can accomplish that you've succeeded.